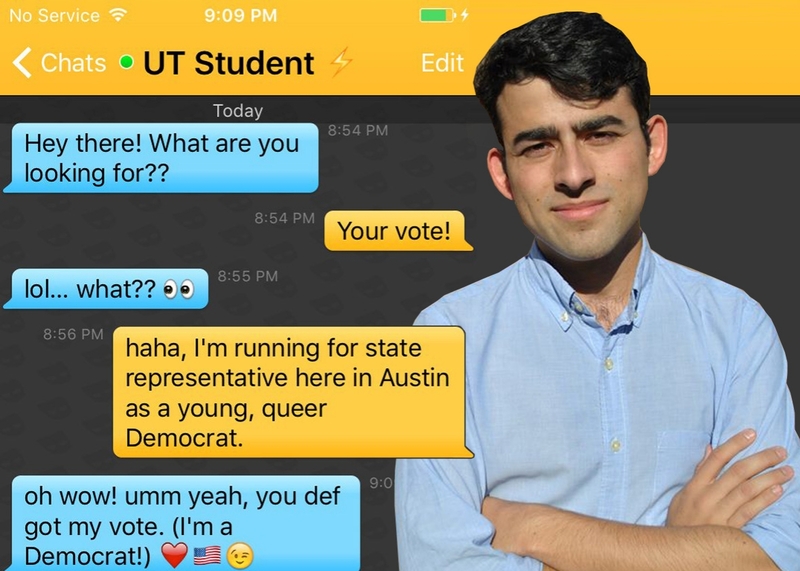 Huey Rey Fischer identifies as a queer, vegetarian, Latino “progressive Democrat on a bicycle.” He is 23 years old, and he’s running for state representative in Texas’ District 49, which encompasses the University of Texas at Austin. A longtime incumbent is vacating the seat, and Fischer, who attended UT Austin, believes he can defeat his six competitors by seizing the student vote in the March 1 primary. Fischer is campaigning in all the ways youth-vote-hungry candidates campaign—college canvassing, early voting drives, a focus on student debt—with a twist: He’s reaching out to voters on Grindr and Tinder, popular dating apps famous for facilitating hookups. (Grindr is designed for gay men; Tinder is for everyone.) On Wednesday, I spoke with Fischer about political goals and his unconventional campaign tactics. How did you decide to campaign through Grindr and Tinder? My campaign was brainstorming ideas about how to engage with millennials. With Facebook and Twitter, people have to opt in—but when it comes to Grindr and Tinder, it’s direct engagement, direct conversations. It’s a medium that my opponents would never be able to use, anyway; it probably wouldn’t be appropriate for a 45-year-old to be messaging millennials on dating apps. We figured it’d be a fun way to engage with voters. Do you message voters from your personal phone? No. There’s a phone in the office dedicated to Tinder and Grindr outreach. We let volunteers come in and strike up messages with people on the apps, as long as they stay on message. “Hey, how’s it going, are you registered to vote?” “Go vote in the Democratic primary for Huey Rey Fischer!” “Huey Rey Fischer is the progressive choice on the ballot!” And so on. Do you worry that you might be abusing the medium? People typically use these apps to connect with potential intimate partners, not politicians. We don’t strike up conversations. We allow other people to strike up the conversation with us. It’s a profile of me, and it says clearly that I’m a candidate for state representatives, seeking votes. When people message us, for the most part, they know I’m a candidate for the state legislature. Fascinating, and ironic in a way since Fischer is campaigning in HD49, now held by the famously Internet-averse Rep. Eliott Naishtat. That field is full of progressive Democrats, so any way to stand out and gain an edge is vital. It would be truly awesome if someone with real statistical chops compared turnout in the (say) 30-and-under segment from 2012 to 2016, and tried to determine if this made a real difference or not. Whatever happens, I salute Huey Rey Fischer for thinking outside the box.